No one wants to live feeling depleted and empty. We all want to live out of a place of abundance, satisfaction, and peace. We hunger to feel like our lives are on the right track and that everything is ‘right,’ in the best sense of the word. The biblical word for this is peace or, in Hebrew, shalom. Shalom means more than simply lack of conflict. Instead, it conveys a sense of completeness, success, welfare, and peace. A short definition for shalom is that all things are right in God’s world as they are supposed to be. When Jesus begins His public ministry, he enters into an episode that would not be described as peaceful. Shortly after His baptism by John, “Jesus, full of the Holy Spirit, left the Jordan and was led by the Spirit into the wilderness, where for forty days he was tempted by the devil. He ate nothing during those days, and at the end of them he was hungry” (Luke 4:1-2). This temptation is a power encounter between the prince of this world, the devil, and the Prince of Peace, Jesus the Messiah. From start to finish, the three temptations of the devil are classic temptations of humanity, described by Henri Nouwen as the temptation to be relevant, popular, or powerful. Hungry and tired, Jesus experiences all the raging temptations of a peace-less world thrown at Him. Jesus overcomes the temptations of the devil, however, and we realize that He is a new sort of king with a new sort of kingdom that will move in ways different from the ways of this world. When Isaiah the prophet describes the Messiah as “the Prince of Peace” (Isaiah 9:6), we know this is exactly what we need. We need true shalom in the midst of our hunger for peace because we cannot ultimately satisfy it ourselves. This realization does not come quickly. Sometimes we must intentionally step back from some things, even normal things like the eating of food, to realize exactly what is going on in our lives. It is no wonder that immediately before ascending to the Father, some of Jesus’ final words to His disciples are: “Peace I leave with you; my peace I give you. I do not give to you as the world gives. Do not let your hearts be troubled and do not be afraid” (John 14:27). The Prince of Peace has come to bring us peace, and that is very good news for us. Take Off: Fast from food (in some form), perhaps for one meal a day or for an entire day. If you are physically prevented from completely fasting due to some health concerns, consider if there is a particular food, drink or “treat” you can deny yourself this week. Use the space below to take note of your experience this week. Put On:In the place of eating the food you are fasting from, take time with God in solitude and silence to experience the peace that God brings. Consider how He provides for you all you need. Use the space below to take note of your experience this week. During Lent at Eastbrook Church, we are exploring how our hungers lead us to God in order to find true rest for our souls. 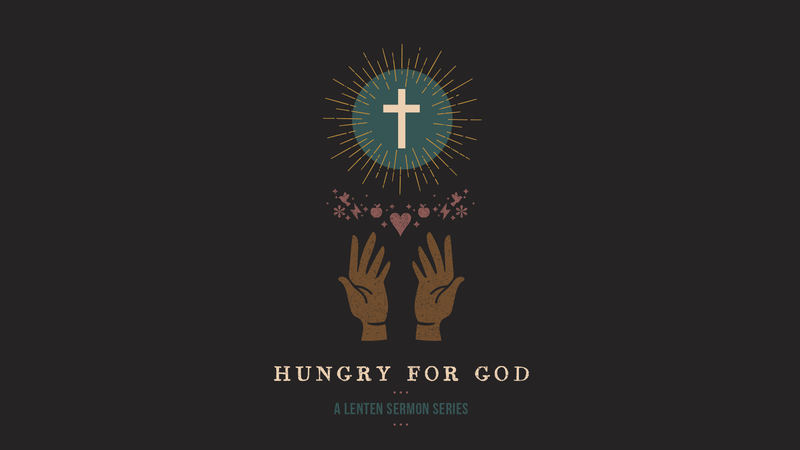 The series, “Hungry for God,” parallels the season of Lent, and has a companion daily devotional that you can access here. Music: “Forgive Us” from At the Foot of the Cross, volume 2, featuring Julie Miller, David Mullen, and Gene Eugene. “God at the Margins (Part 1 of 3)” – My dear friends, Michal and John Chabo, share their story of God’s faithfulness in the midst of the challenging environment of Syria. You do not want to miss this amazing story from these two wonderful men. You will also enjoy finding out more about their work with Chabros Music, including leading worship at many churches and telling their story as an encouragement to others. The ongoing saga at Willow Creek Community Church continued to heat up with the August 5 New York Times article “He’s a Superstar Pastor. She Worked for Him and Says He Groped Her Repeatedly.” Shortly before this, Lead Teaching Pastor Steve Carter announced his immediate resignation in protest of the way the women who have come forward have been treated (read his “A Diverging Path”). Then, on Wednesday night, Lead Pastor Heather Larson announced her immediate resignation, and that the entire Willow Creek Board of Elders would be steeping down. If you don’t know the entire story about what has come forth in regards to former Senior Pastor Bill Hybels and the way in which leadership of Willow Creek handled accusations of sexual misconduct, take a look at Scot McKnight’s recent post in this regard. You may also benefit from reading Mel Lawrenz’s reflections on what this speaks into the lives of leaders. “Citing Religious Liberty, Evangelical Leaders Urge Trump Administration to Support Refugee Resettlement” – Evangelical Christian leaders have sent a letter asking the Trump administration to raise the refugee ceiling, citing religious liberty and our nation’s history of offering safe haven to people fleeing religious persecution. Signatories express deep concern that further cuts to the U.S. refugee resettlement program would harm religious freedom internationally. The letter was sent to Secretary of State Mike Pompeo, Secretary of Homeland Security Kirstjen Nielsen and Ambassador-at-Large for International Religious Freedom Sam Brownback. “The Truth About the Catholic Church and Slavery” – Rodney Stark takes on one of the most-debated issues in relation to the culpability of the Roman Catholic Church in relation to the international slave trade. The claim that Christians were actively involved in promulgating slavery is beyond debate. However, Stark suggest that the role of the institutional church and its teaching came against that much more clearly and much earlier than often claimed. When I was Pastor of Collegiate Ministries at Elmbrook Church, our ministry, The Ave, hosted a 24/7 week of prayer in partnership with other college ministries around the city of Milwaukee. We drew a lot of our ideas from a group based in the UK, known as 24-7 Prayer, founded by Pete Greig. They have an excellent resource page that a friend, Caitlin Ewing, shared with me and my wife, Kelly, just this past weekend (thanks, Caitlin!). TAKE TIME – Go deeper in your prayer life and spend a little longer in God’s presence. BLESSING MUSLIMS IN PRAYER – be equipped to pray and bless Muslims with resources from our friends at Mahabba and Frontiers. I often refer to fasting as an important spiritual growth tool in our lives. Some time ago, I wrote a number of posts on the subject of fasting and I am gathering all of those together here as a resource for understanding fasting in general. These posts also address a number of specific aspects of fasting, biblical background on fasting, and some practical helps for how we approach fasting. I hope this is helpful as you step forward by fasting in order to say ‘no’ to yourself and ‘yes’ to God for growth into the abundant life by the power of the Holy Spirit. Fasting: Why Do We Do It?